Multi colored genuine watermelon tourmaline gold love bracelet. 14k Gold filled love bracelet. Who do you know that needs more love in their life? 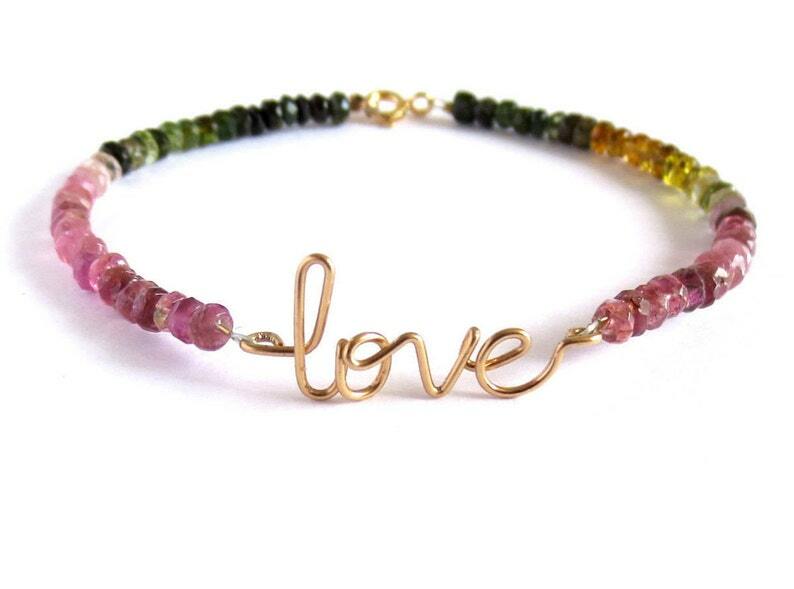 Get some with this gold love bracelet mixed in with some watermelon tourmaline. Watermelon tourmaline is said to promote unconditional love. Tourmaline is also the birthstone for October and is said to promote unconditional love. This gold love bracelet is hand made with the word love hand formed from 14k gold fill wire and with faceted watermelon tourmaline gemstones and a spring ring clasp. The size of the gemstones are about 3mm x 4mm. Individual gemstone colors may vary slightly from bracelet pictured. The third photo shows a size reference only. The size of the bracelet pictured is 7 inches, however, the length is customizable from 6 to 8 inches. Questions about size? 7-7 1/2 will fit an average size adult woman but if you aren't sure, take a piece of yarn or string, wrap it around your wrist and where it sits loosely, measure that length with a ruler. The word love will be in all lowercase letters. Your bracelet will look like the one pictured. Need a custom word or personalized name bracelet instead? Message me for more info. What is 14k gold filled wire? It is 14 karat gold coated over alloy metal which may contain brass, nickel, steel and other metals. It is 1000x thicker than gold plated and will last several decades or even a lifetime if cared for and stored properly. Care Instructions are included. Green Peridot Gemstone Bracelet. Genuine Natural Light Green Gemstone Gold Bracelet. 14k Gold Filled Peridot August Birthstone Bracelet. Rainbow Gemstone Bracelet. Delicate Faceted Genuine Gemstone Gold Bracelet. 14k Gold Filled Rainbow Bracelet. Lapis Lazuli Blue Gemstone Bracelet. Faceted Genuine Natural Gemstone Gold Bracelet. 14k Gold Filled Dark Royal Blue September Birthstone. Citrine Bracelet. Gold Intense Yellow Citrine Bracelet. Stacking Gold Bracelet. November Birthstone Bracelet. Watermelon Tourmaline Anklet. Genuine Pink Green Tourmaline Gemstone Gold Ankle Bracelet. Summer Ready Dark Pink Ankle Bracelet.